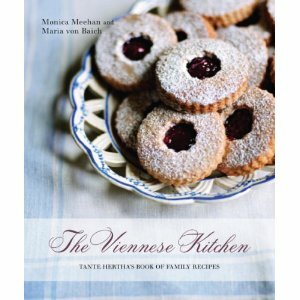 This beautiful book, The Viennese Kitchen by Monica Meehan, based on an original notebook and recipe journal of a 1900s baroness, takes readers on a journey through fin de siecle Viennese high society. With over 100 original recipes, all of which have been tested and brought up to date for the modern cook, it is not only a wonderful collection of recipes but also a fascinating look at the life of a Viennese family. Filled with anecdotes and personal stories to bring the recipes to life, this book is a charming insight into a bygone era. The classic recipes cover a variety of dishes both savory and sweet, with a strong emphasis on the desserts and pastries for which Vienna is famed. Enchanting photographs of Vienna grace the book, capturing the architecture, cafe culture, and beauty of this elegant city. Those of us of a certain age (ahem) can remember the last time fondue was all the rage. Suddenly fondue pots were the hot gift and fondue parties the way to entertain. Like most fads, this one faded away and the fondue pots disappeared into attics and the back of cupboards. Well, you might want to go looking for that nearly forgotten relic – fondue is back and this time it intends to stick around. Of course, fondue never really went away – it’s a traditional meal in Switzerland dating back maybe as far as the 16th century (there is some disagreement on this) – but partly due to the returning emphasis on “slow food” and the importance of sitting down to a meal with family and friends, fondue is popular again. 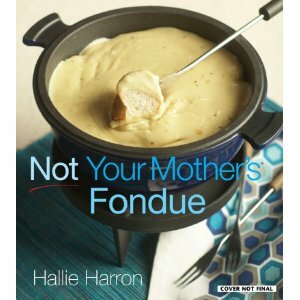 Not Your Mother’s Fondue by Hallie Harron is just the book to reintroduce you. The basics – cheese, sauce, oil, broth and dessert – are all covered, many with fresh, fun twists and a wide range of dippers are suggested. There are also some thinking-outside-the-box ideas such as Minnesota Corn Dogs on a Stick Fondue and even a Thanksgiving Day Fondue! Of course, the best part about fondue, even beyond the delicious food, is the way it brings people together. Start a new tradition with your family and friends with great fondue meals! I’ve always struggled with trying to lose weight while still eating the delicious (and often fattening) foods that I love. 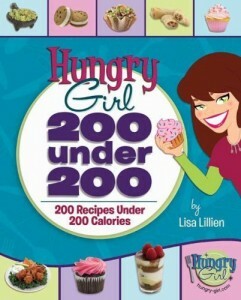 It got a little easier when I discovered the Hungry Girl cookbooks, written by “Hungry Girl” Lisa Lillien. 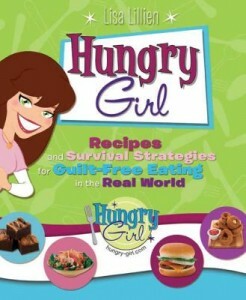 Her books Hungry Girl: Recipes and Survival Strategies for Guilt-Free Eating in the Real World and Hungry Girl 200 Under 200: 200 Recipes Under 200 Calories contain recipes for the foods we already love, but made in a more healthy way. They’re also pretty easy to make; Hungry Girl’s recipes don’t contain a ton of ingredients or steps, so they’re not too difficult for someone like me whose preferred cooking steps are 1) Preheat oven 2) Insert frozen pizza. I’ve tried out a few of her recipes so far, including the Krispymallow Treats and the Cheesy Chicken Quesadilla, and they were great! I even made her recipe for a cupcake baked inside an ice cream cone for my family and they didn’t realize it was a “diet recipe”. The Hungry Girl books contain more than just recipes. Lilien has also made lists of products to use to make your cooking lighter and a series of “Survival Guides” for how to eat out at restaurants without gaining 10 pounds per meal. Now that I’ve tried a few recipes and trust Hungry Girl’s directions, I might even try some of her more ambitious recipes, like the Kickin’ Chicken Tortilla Soup and Fiber-ific Fried Chicken Strips. If you want to lose weight but don’t want to give up your favorite foods, I suggest checking out the Hungry Girl books to see if she has a solution. I’ll bet she does! 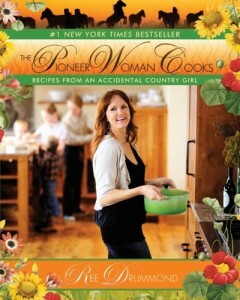 The Pioneer Woman Cooks is an unique combination of cookbook and sociological essay. Ree Drummond got sidetracked on her journey from L.A. to Chicago, when she stopped in Oklahoma and met the cowboy who was to become her husband. The photographs of horses, dogs, cowboys and rainbow straddled fields are sometimes cute and funny, sometimes striking and romantic. They alone make you want to pack your bags and move to a ranch out West. By now, if you planted a garden this spring (perhaps with a bit of help and advice from the library), your kitchen counters are beginning to overflow with tomatoes and zucchini. Even if you didn’t put in a garden (or had some bad luck with the weather or pests), the Freight House Farmer’s Market is a treasure trove of gorgeous, fresh, local fruits and vegetables. Here are some new cookbooks to help you get the most out of the harvest. Homegrown by Marta Teegen. This charming book is loaded with lots of information, clearly and concisely presented. Not sure when to pick the eggplant? Wondering what to do with all that Swiss chard? 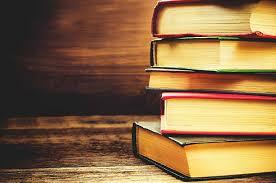 Reach for this book. Recipes and practical growing tips make this a winner. More Vegetables Please! by Elson Haas and Patty James. Squeezing more vegetables into your diet can be fun and delicious. You’ll find lots of kid-friendly recipes here that are packed with nutrition and flavor. Seasonal Fruit Desserts by Deborah Madison. OK, maybe your tangerine tree hasn’t started producing yet, but the Farmer’s Market is filled with the summer bounty of peaches, raspberries, melons and apples. Fruits of all kind take center stage in dozens of tempting recipes. Part travel guide, part cookbook, the best word to describe this gorgeous book is “stunning”. 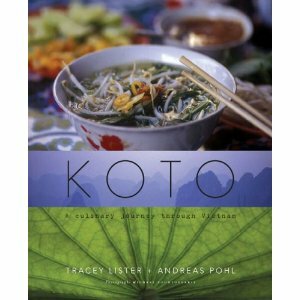 Koto: a Culinary Journey Through Vietnam is filled with beautiful photography, mouth-watering recipes and an eye-opening look into this complex and distant land. Beginning with a thoughtful overview of the long history and diverse cultures of this beautiful nation, the authors then bring us to contemporary Vietnam where they lived and taught for two years. Divided into seven main food regions, the book provides a dish by dish journey through the long, skinny country. Recipes are relatively simple – very few take up more than a page – and where necessary have been adapted to the Western kitchen with ingredients that are available in most Asian supermarkets. To page through this book is to immerse yourself in another culture on a delightful – and delicious! – journey of discovery. Heavenly indeed. 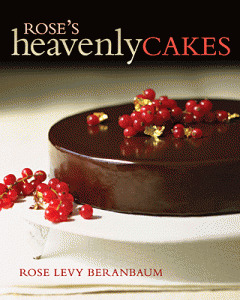 Rose Beranbaum’s newest book, Rose’s Heavenly Cakes will send anyone who loves cake (and really, who doesn’t love cake?) into raptures of delight. Watch out – just looking at the pictures might cause you to gain weight! 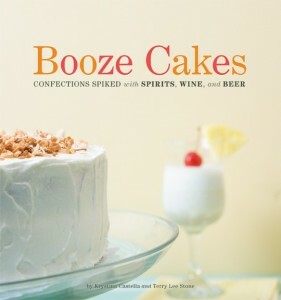 Recently named the Cookbook of the Year by the International Association of Culinary Professionals, Rose’s Heavenly Cakes covers cakes of all kinds, from simple to complicated. Arrangement is by type of cake – butter and oil, sponge, flourless and cheesecakes, baby cakes (cupcakes and individual cakes) and wedding cakes. They run the gamut from traditional – angel food cake, trifle, triamisu – to the complex – Miette’s Tomboy, Golden Dream Wedding Cake – to the spectacular – such as the Apple Caramel Charlotte or the Holiday Pinecone Cake. 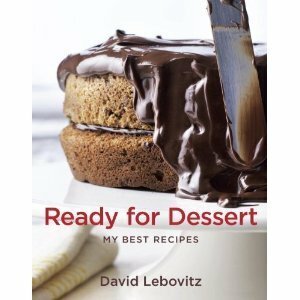 Recipes are presented in Beranbaum’s signature style – ingredients listed in a chart, special equipment and techniques explained, detailed instructions on creating the cake, tips and suggestions for success. While many of the cakes may seem to be only for the professional or the experienced baker, Beranbaum’s friendly, can-do style and excellent instructions offer plenty of encouragement for anyone. If you’d like to start with something a little less ambitious, there are plenty of simple, mouthwatering cakes too. And after a taste of success and you’re ready to stretch your baking wings, Rose’s Heavenly Cakes will be your guide. Just because we’re deep into the dark days of winter, surrounded by cold and snow and ice, that doesn’t mean you can’t still enjoy great homemade food. 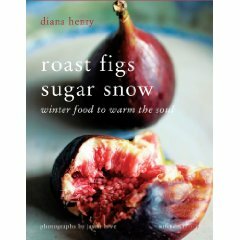 Roast Figs Sugar Snow by Diana Henry is geared to show you just how great cold-weather cooking and eating can be. Henry has brought together a collection of ideas and winter recipes from the Northern Hemisphere including northern Italy, France, Russia, Vermont and the Scandinavian countries. The emphasis is on food that stores well for the winter – apples, pears, root vegetables, squash, nuts – and hearty meats – pork, beef, smoked fish. Dishes reflect the regions they are adapted from such as Mussel Chowder from Quebec, Swedish Thursday Soup, Danish Christmas Kringle and Russian Cheese Pancakes. Scattered throughout are essays on the unique pleasures of winter food (including, yes, a discussion of sugar-on-snow parties, familiar to many from reading Laura Ingalls Wilder’s Little House in the Big Woods and which still take place in Vermont today) The overriding theme of this beautiful book is that winter isn’t necessarily a time to endure, but a season to be enjoyed and savored.